“What do you wear for real life, when you are not going out for a fancy date?” “What do you order when you go to a regular restaurant?” “What do you wear when the weather is sweltering?” “How do you prepare healthy meals for one?” “What do you wear when you walk or exercise?” I appreciate that some of you send me your questions. It helps me to share more helpful tips and inspiration. This week on the blog, I will answer some of your questions. Sunday is the day we rest, catch up on a few errands and visit with family. Both Mr. Mickey and I have family members living nearby. We visit with them, bring food, puzzles or books and check in often if not daily. The sick and elderly appreciate a visit more than anything. It is a delight to recall pleasant memories with someone you love when you spend lots of time alone. Our weather is not ordinarily hot and sticky in October but that’s what we have this year. Yesterday we stopped by both our Post Office Boxes, picked up medications and ran errands for others and visited with family. 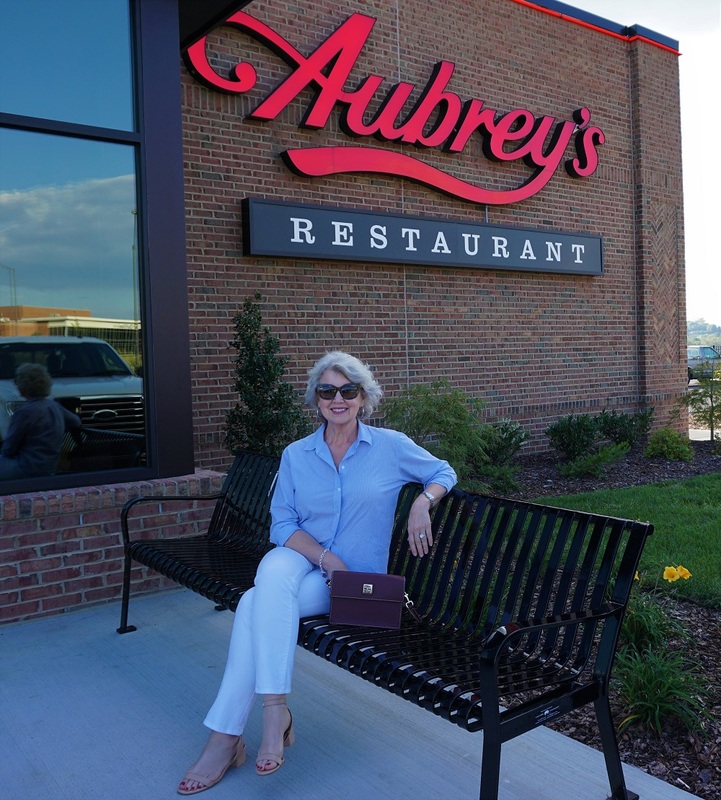 Later in the day, we shared a late lunch at Aubrey’s which is a local chain restaurant. 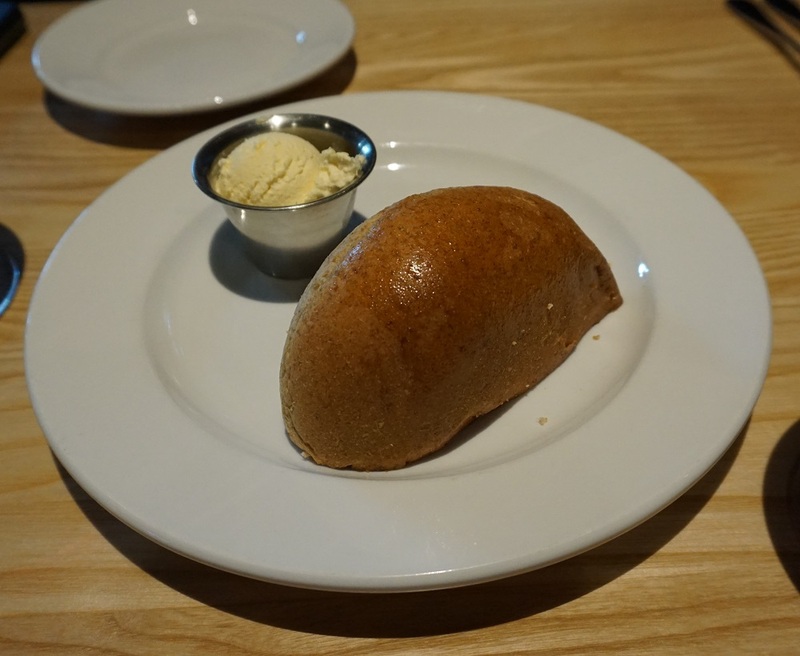 Bread is served with every meal if you want it. Guess who always says “yes, please”? 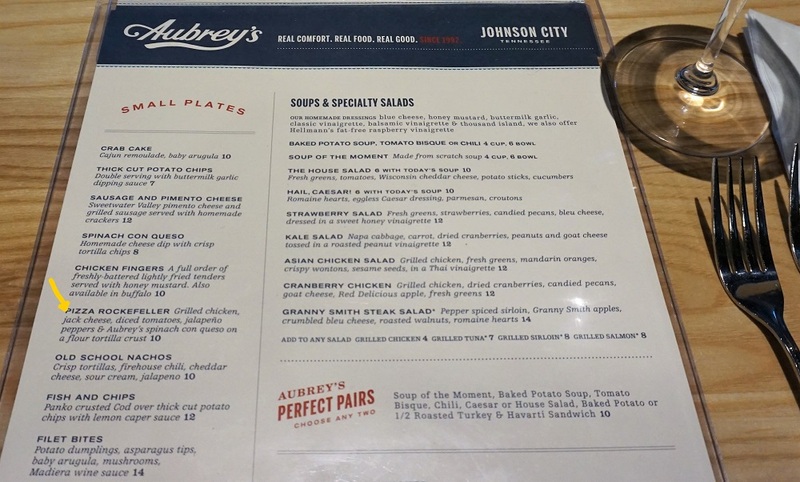 We often share an appetizer or a Small Plate as our entrée. 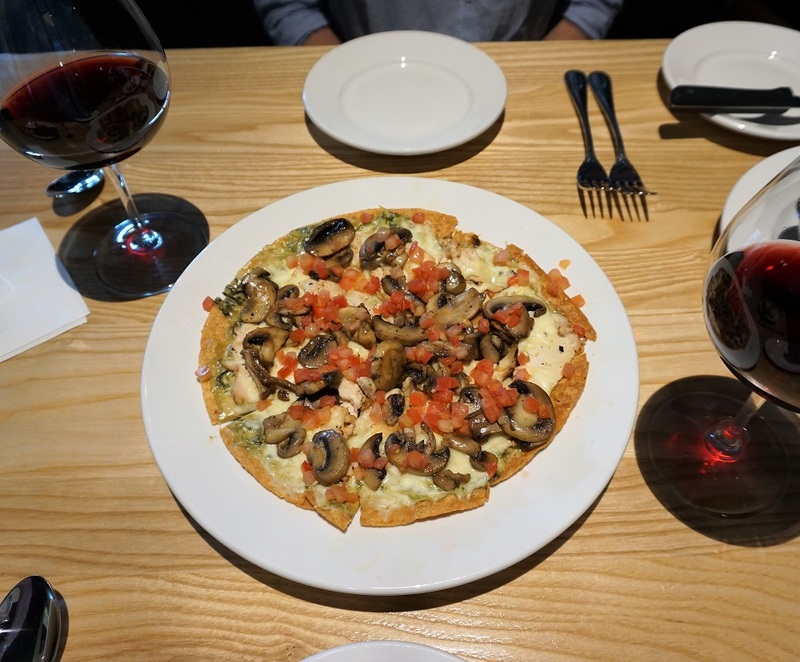 One of our favorites is the Pizza Rockefeller, but we ask that they substitute the peppers with mushrooms. Neither of us enjoys a large volume of food. 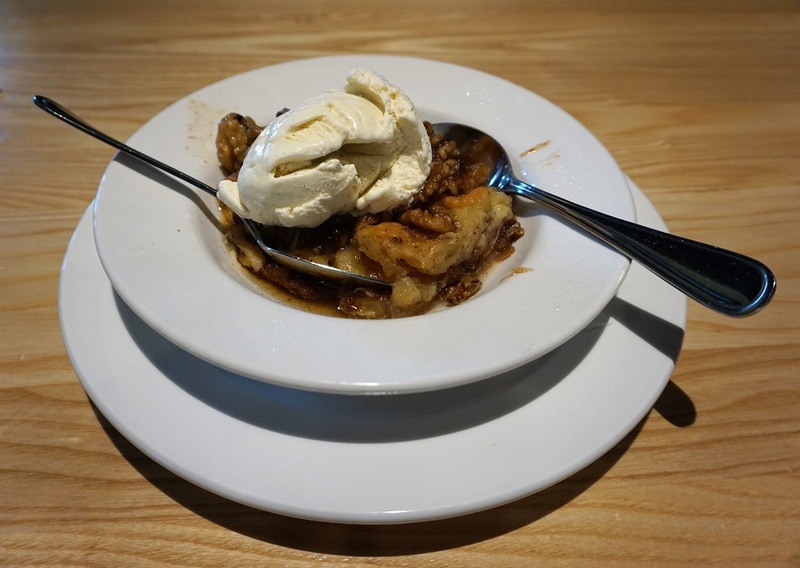 Mr. Mickey’s favorite dessert is an apple cobbler with a scoop of vanilla ice cream. I have a few bites and leave the rest for him. The second half tastes the same as the first. 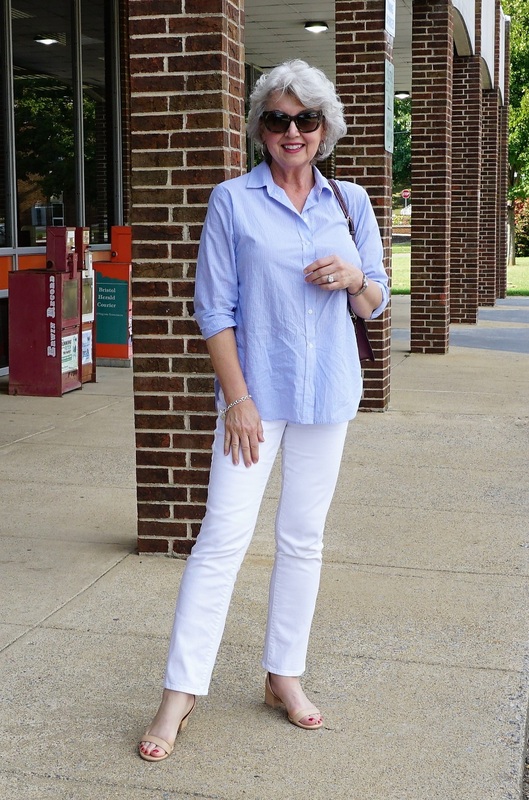 My casual hot weather look always includes lightweight white pants and cotton lightweight shirt. Cotton and linen wrinkle easily but no other fabrics are as cool. My almost sheer blue and white striped shirt crisply ironed at the beginning of the day, is from Everlane here. A less expensive version is here. The white cotton blend pants are from Chico’s a couple of years ago. Similar pants are here. The bag is my nod to fall. It is by Dooney & Bourke here. A less expensive version is here. The sandals are old from J.Jill. Similar shoes are here. A less expensive version is here. Referral and affiliate links in my posts may generate a small commission for Susan After 60 Inc. I created this site to honor and serve women of all ages. The shopping site here provides classic basics and accessories. My ongoing studies include style advice from image and nutrition experts so that the tips I share with you are never just me sharing my opinion. I use art and science to inspire outfit selections and to help you stretch your wardrobe possibilities while looking your best. 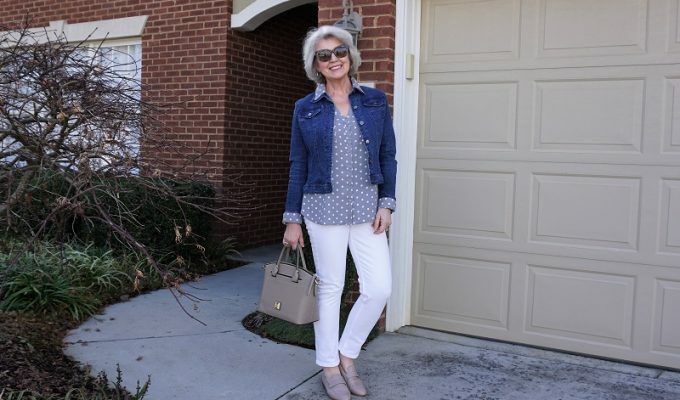 SusanAfter60.com is an online space where women can share their thoughts, ask questions, gather style tips, be inspired, and learn more about nutrition. Do you mind telling whst size you’re wearing in the shirt? Can’t decide which size to order. I buy these in a size 10. Looking great even on errand day. 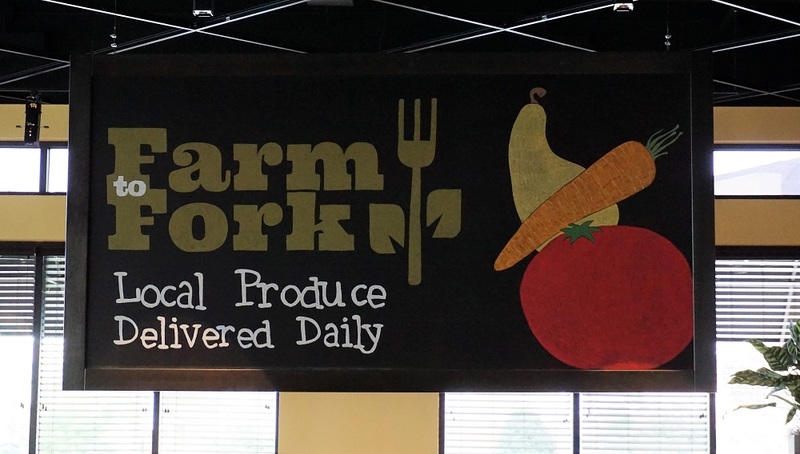 Great places to eat in your area. Enjoy the fall season! Thank you Susan for your helpful tips. I always look forward to reading your blog and positive energy. Very nice look for running errands. Thanks again for another informative blog. 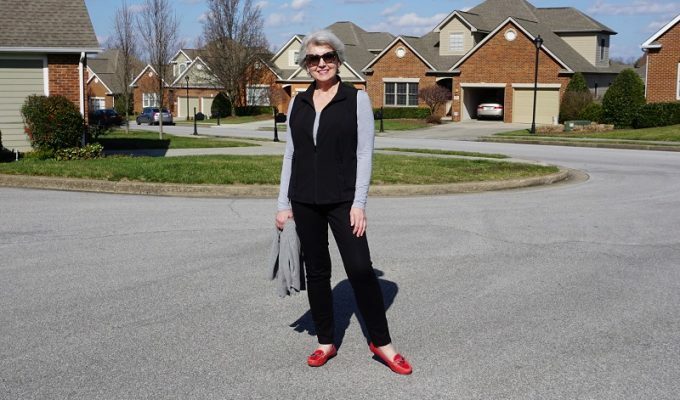 Do you wear a shapeeze even when dressed casually like here in this post? Yes. I wear a Shapeez bra every day. They are the most comfortable bras I have ever worn. 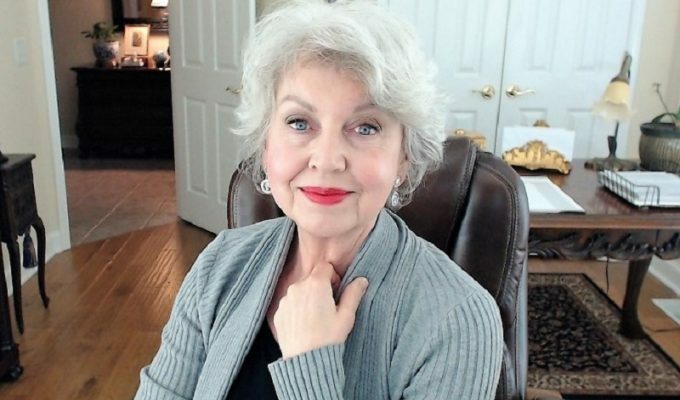 Thanks for sharing, I wish you would do a post on makeup, esp skin care after 60!! My old stand bus no longer work. Thanks for including the less expensive versions. I live on Social Security exclusively and don’t have extra income to spare. Thanks. When you buy sandals do you go up a size or half a size? I don’t like the overhanging toe look. However if they are too large then they don’t stay on your feet. I buy my regular size. Mr. Mickey is so healthy looking. Does longevity run in his family? Would he share his secrets to appearing so healthy? I realize some illnesses don’t show and he may not feel as good as he looks, so I respect his privacy. He hasn’t always chosen to eat healthy foods. About nine years ago he had a massive stroke and had cancer numerous times, and he also has diabetes. Changing his eating habits has vastly improved the quality of his life and health. He inspired me to make a lot of changes in my diet, and I have enjoyed the same positive results. As a “T” girl, I am very careful about my wardrobe choices. Your outfits always show that ‘less can be more’! 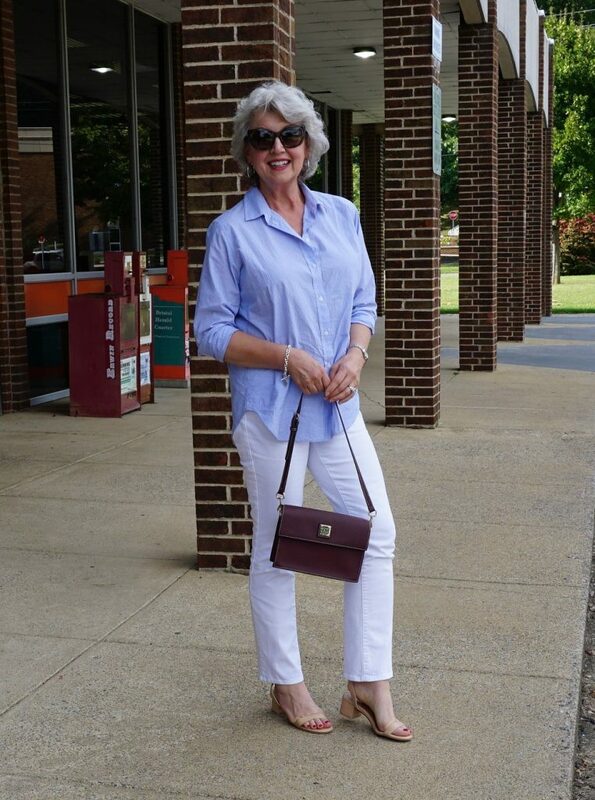 I’ve found that if you press a damp linen blouse on a flat surface with just your hands, instead of a hot iron, then hang to finish drying, it results in a softer, more casual look and easier to wear. If it needs a touch up after a wearing, spray with a mister bottle and repeat. Check the Friday blog for everything about my walking/exercise gear. Have a great day! May be hard, but I’m actually looking for colder weather tips. In the 40’s here in the Midwest and I love the fashion tips I’ve learned from you. Has made shopping so much easier! We have much lower temps here tonight too. Cold weather looks are coming!